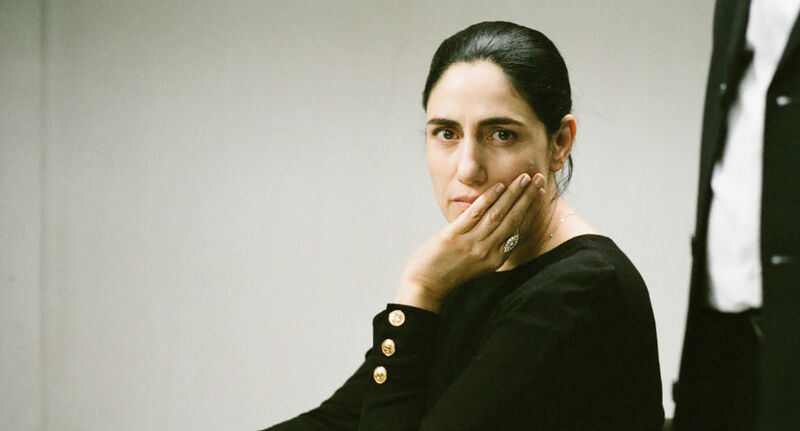 Gett: The Trial of Viviane Amsalem is the third film in a series by sibling directors Ronit and Shlomi Elkabetz following the titular Israeli woman (Ronit) as she navigates the turbulent waters of her failing marriage to her husband, Elisha (Simon Abkarian). It takes place entirely in an Israeli courtroom over five years, chronicling the tragically protracted process of Viviane filing for divorce and being rejected over and over again. Per Israeli law, the only person with the power to grant her freedom is Elisha himself, who isn’t willing to oblige, holding her captive in the truest sense. An enraging demonstration of the powerlessness of women in the rabbinical court system, Gett will force you to stop in your tracks and think hard about this unjust, outlandish law that exists in Israel to this day. With hope, the film will reach enough people and change the course of Israeli women’s history forever. While on a visit in San Francisco last fall, we spoke with co-director Shlomi Elkabetz about his hopes of the film making real change, Israeli and American reactions to the film, his love of American cinema, configuring the courtroom to create different atmospheres, shooting the film entirely in POV shots, and much more. What have Americans’ reactions to the film been so far? These are my first days in America with this film. I did present it at TIFF, and I got reactions from Americans when I presented it at Cannes, but today is going to be the U.S. premiere. A lot of people say it’s really infuriating. What kind of reaction are you anticipating? The way I constructed the drama in the film is extremely methodized. She says, “I want to get a divorce.” He says, “No.” And that’s it. It’s very simple in that sense, and some great American films have one simple shot about something, and you can [stretch] it for three hours…and it works! [laughs] Great directors did it, and it’s something that represents, for me, good American filmmaking. European filmmaking is about a lot of thoughts. It’s more reflective. In this movie, there’s nothing reflective. It’s very simple. The rule is simple: if he doesn’t say yes to the divorce, she doesn’t get it. Now, let’s play on it. If you look at courtroom dramas like La passion de Jeanne d’Arc by Carl Dreyer, or The Trial of Joan of Arc by [Robert] Bresson, you see that these films are structured in a [particular] way of filming and thinking, but Gett is more influenced by American court drama scenes and films that were made in the ’40s and ’50s that are gone now, but used to be very strong. When finishing the script, that was my first thought, and I was actually very happy about it. So that wasn’t you’re intent from the beginning. When we started making the film, my primary decision was to not shoot an establishing shot in the film and [instead] only shoot from the different points of view of the characters, which gave me the opportunity to cut the film, which I didn’t do in the other ones. I had many options of how to cut the film within the scenes, so I could actually re-tell the whole story in the editing room. I had 110 hours of material, which is extreme for me, but it gave me an immense tool to recreate the suspense in the room from scene to scene. I was very curious what American audiences would think of this film. The base of the film is very strange to American audiences. Why can’t this woman decide [whether she leaves the marriage or not]? To grasp the idea of not being able to move on when you want is crazy. Can they grasp it at all? Maybe they’ll think it’s a film about something that happened 4,000 years ago, which is the age of this law. But slowly, I thought that through viewing the film people would learn the law, and now I’m really curious to see how they’ll react. Are people in Israel infuriated by the film? Yes. When you get married there, you don’t think about divorce. You think about the guy you love, the woman I want to spend my life with. The dress, the suit, the food, the music, the party, the kids…the whole idea of conjoining. People who’ve never been divorced are completely unaware of the upcoming events that might shock their life one day, so they’re shocked. Certain characters in the film don’t know how to react to the news. They’re very confused. Right. People over there who have been divorced are repelled by the film, because it brings them back to a very bad experience. The most interesting thing about the film in Israel is that…[pauses]. People never talk about divorce. There are thousands of women in Israel who are waiting to get a divorce, but somehow, society has managed to push them aside. They’re women, to begin with, so it’s easy. But somehow, divorce was never a part of the discord, the dialogue of the state. What’s happening now in Israel that’s fascinating to me is that people are extremely active [about the issue now]. People are writing, putting up posts. Newspapers write about it every day. The Minister of Justice wrote a huge post on Facebook, [as did] a few parliament members. Some very important journalists are using Facebook to [raise] awareness of the subject, and the Minister of Justice is sending people to see the film! It’s huge for me. It’s like…something is happening. I think people are struck by the film. One of the reasons is that, in Israel, you can go to see a murder trial, any criminal trial, but you can’t enter a divorce trial. They happen behind closed doors. This film is like a key to these doors, and when people enter this court, what they see is shocking. Even though they know the law, they understand how easy it is to do to what they’re doing to Viviane. It’s easy: the husband just has to say no. When we worked on the character of Elisha, [Simon] said, “When I say no, I’ll look at her or do something with it.” I said, “No, no. You have to do nothing. All you have to do is remain where you are and say no. What you’re saying is enough.” The ease of how he says no is what shocks people. How has the conversation about the morality of this law been avoided for so long? It’s very complex. I think that part of the definition of being Israeli is driven by religion, you know? When Israel was established, it was as a Jewish home for Jewish people. Which means, you have to be Jewish to be Israeli. That’s the definition of the place. How do you determine who’s Jewish? You must control birth, marriage, divorce, and death. Through these four stations you must go through the religious authority. That’s one of the reasons why the law hasn’t changed. It’s a way of controlling the population. You have to remember that only 12 or 13 years ago, we took out of our identity cards the religious denomination of the citizens. Until then, it said whether you were Muslim or Jewish…it’s a process. But it’s happening, and eventually…[pauses]. I tend to be optimistic about it. I think the law will change. If the film were to change something, I would be high in the sky. I’m happy if the film changes the awareness of people, but I’ll be so, so happy if it changes the course of women’s history in Israel. That would be a real victory. The film very well could change history. How much do you think about that? I think about it a lot. We won the Ophir prize, at the Academy Awards of Israel. It was a very tense evening. We got the prize, and everybody wanted to win. When Ronit and I went onstage and spoke, she said, “This is a great prize, a hug from you to us. But more than that, it’s a victory for the spirit of women.” She’s right about that. The idea of this film changing the law in Israel at some point is something I’m really excited about. In my dreams, I see the minister from Israel going to see his colleague from Switzerland, who’s just seen the film with his wife. [laughs] And the Swiss Minister says, “I didn’t know Israel was so tough on its women!” and then the Israeli minister goes back home and tells all his colleagues. I see it working from inside and outside. The way I see it, our job as filmmakers, especially in Israel, is to make films to entertain, reflect the society, and change history. Let’s rewind a bit, to the making of the film. Like you said, the film’s premise is simple, because the husband having the absolute power to say no is dramatic enough on its own. The movie is almost two hours long, has this simple premise, and takes place in one room. It’s so minimalistic. So the last, critical piece of the puzzle is filmmaking, your cinematic technique. To make those two hours in that one room so compelling requires sound technique, and you pulled it off incredibly well. When we decided to write this film, we didn’t believe we would fill up 85-90 pages of script. What’s going to happen in this one room for 90-100 minutes? Writing is miraculous; we wrote the script, and it was a miracle. We went to this room, and we brought in the cameras, the lights, and we said, “What now?” We have nowhere to go! But then you ask yourself, what are my tools as a director? Slowly, beat by beat, you realize you have so many options in one room. One of the first things I did was make a light script. I didn’t want the light to be from inside the courtroom, so I created, like, 17 different atmospheres of light that come from outside. I’d ask for each scene, “What kind of day is it outside? Is it winter? Summer? Is it morning? Noon? Cloudy?” All of these questions about how it was outside. Then, we tried to create specific light for each kind of day. To light the room from outside, which creates conflict with the neon light in the court, you can start to create different moods and atmospheres. It’s the same with the sounds. “Who’s standing outside the door? What’s happening outside? Who’s coming up the stairs? What car is passing by? Is there traffic?” I built a whole scenario of sounds that was then implanted into the film in a very specific way. There’s a lot of dialogue in the film. The courtroom is like a little theater. Someone gets up, says what he has to say, sits down, and that’s it. The show is over. The dialogue was very easy to shoot. The next thing I did was shoot a silent film, meaning only shooting point-of-view shots. I never took a director’s shot in this film, no establishing shots. Only POV shots. The camera is always in the place of somebody who’s looking at someone else. So I was shooting how the [characters] looked at each other. I started to stretch the space. The minute I shoot you talking to somebody else, I start to stretch you. You’re talking to someone else, but you know I’m looking at you, so you’re stretched in between my camera and the other actor. Then, I add another point of view, so that stretches you to another direction. Then I stretch you again, until you’re spread all over the room. Then, in the editing room, I reconstruct the space according to the different looks, hoping to recreate the suspense. One of my favorite things about the film is how it engages the imagination, since so many events take place off-camera, outside the courtroom. We only hear about them, and we must piece together a picture in our mind, but that mental picture is actually quite vivid. We kind of defined it in the script before shooting. Some scenes were interior scenes, and some were exterior scenes. We wrote it right on the script. Some scenes were meant to be imagined completely outside of the court, and some were meant to stay in the court. Every time we cut from one scene to another, there’s a thousandth of a second where we expect to be out [of the courtroom]. We expect to be free. And the minute we expect to be out there, we imagine the exterior. Imagine somebody puts you in a room, and it’s a surprise; you didn’t know they were bringing you there. At a certain moment, somebody says, “You can open the door.” Of course, at the moment before you open the door, you imagine what’s behind the door. You imagine the exterior that you think is out there. You open the door, and it’s another room. But for that moment, you were completely free. Viviane is playing with us. We say it’s The Trial of Viviane Amsalem. Does that mean that Viviane is on trial, being judged by all these men? …and everybody is coming to be judged by her? The Beach Boys' Brian Wilson gets his own biopic with Paul Dano and John Cusack.